Bieber attended the church service without his wife, Hailey Baldwin, on Wednesday. Justin Bieber is leaning on his friends. The 24-year-old pop star was seen attending Hillsong Church in Los Angeles on Wednesday, shortly after news broke that his ex, Selena Gomez, had been hospitalized for mental health treatment after a reported emotional breakdown. 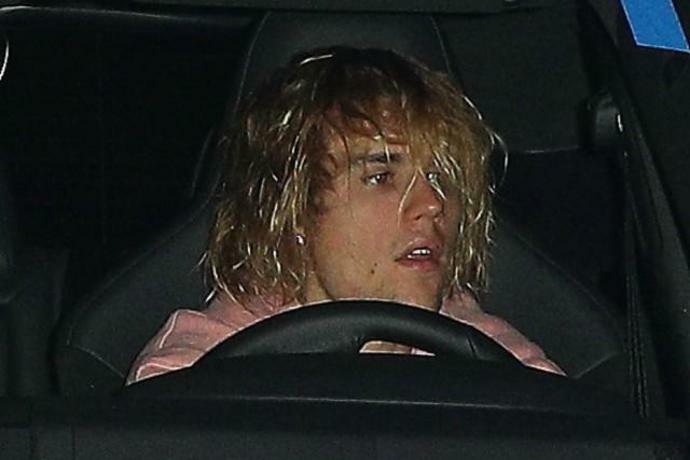 Bieber looked visibly disheveled, with his long hair tousled in front of his face, wearing an oversized pink sweatshirt as he showed up to the church solo. Hailey Baldwin was not in attendance. After the service, the "Sorry" singer was seen returning to his car with a group of friends, who comforted him with hugs. Bieber shielded his face from the cameras as he got back in his car and drove away. A source tells ET that Bieber is "upset" about the news of Gomez's hospitalization. "Justin was very upset when he heard the news about Selena," the source says. "Selena holds a special place in his heart. Justin spent most of the day alone, and even took a solo hike to the Wisdom Tree in L.A. to get away and decompress. Justin then went to his church where he was noticeably upset, without Hailey, and was comforted by friends." "Above everything Justin wants the best for Selena," the source continued. "When the two rekindled their romance, he got to see how her health really affects her, so he understands how serious this is." It is unusual for Bieber to attend church without Baldwin as the couple have been spotted at several services together. It just so happens that Gomez, 26, also attends Hillsong Church. Earlier in the day, Baldwin shared a sweet kissing photo to Instagram Stories with her guy. The 21-year-old model and Bieber secretly tied the knot in New York City last month, but have not publicly confirmed the news. "Justin and Hailey are legally married, but Justin is telling friends he isn't planning on wearing a wedding band for a while," a source previously told ET. "As much as Hailey and Justin are public about their relationship, they are trying not to make a spectacle of it, and that is why they kept their marriage under wraps and got engaged without telling anyone." As for Gomez, she's getting the treatment she needs after several health setbacks. Another source tells ET that the "Wolves" singer sought treatment at a mental health facility. According to several reports, Gomez has been to the hospital twice in the past few weeks. The first time came after she was in low spirits and emotional over an alarmingly low white blood cell count. The hospitalization drove Gomez to have an "emotional breakdown" where she had a "meltdown" and "freaked out" when she wasn't allowed to leave.